Fall time is here, there are so many great activities to do in the area especially within the month of October. “I love sitting in front of the fire in the fall” Elena R.
Pooches and people alike will gather Saturday, October the 28th from 1-3 p.m. at Marshall Park to celebrate the Midtown Halloween Festival and Pooch Parade. Our four-legged friends will strut their stuff and show off some creative costumes for a chance to win prizes! Bring the family and enjoy a fun filled day at the Rickey Ranch Pumpkin Patch! See their farm animals, pony rides, tractor-pulled hayrides, homemade pies, local honey and perfect pumpkins for Halloween. Located on Cavitt Stallman Road in Granite Bay, Rickey Ranch Pumpkin Patch is operated by the Rickey Family whose farm was has been operating under the same traditions for six generations spanning over 150 years. Rickey Ranch practices organic farming methods for everything they grow which includes pumpkins and gourds, fruit, bees, beef and 20 acres of vineyards. Rickey Ranch Pumpkin Patch is open every day from 10 a.m. to sundown from October 1 – 31. Admission and parking are free, hay rides are $3, horse rides are $5. Rickey Ranch Pumpkin Patch is a small family-owned ranch, so they do not have a website, but they’d be happy to answer you questions by phone at 916-599-2071. This one-of-a-kind annual event will be held from 1 to 4 pm on October 21 at the Wackford Aquatic Complex in Elk Grove. 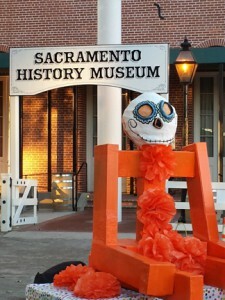 The Sacramento History Museum and Old Sacramento Living History present the ever-popular Ghost Tours each October. Come join the “ghosts” of early Sacramento on an eerie journey back in time! Beware of wayward miners, murder victims, and other colorful Gold Rush characters. Hear tantalizing tales of how folks lived – and died! – in our fair city. Old Sacramento Ghost Tours depart from the Sacramento History Museum at 101 I Street in Old Sacramento. This mile long guided walking tour lasts approximately one hour. Each tour can accommodate up to 25 people. Come dressed for the weather outside and wear comfortable walking shoes. Tours run rain or shine! Celebrate the ancient traditions of el Dia de Los Muertos with Sol Collective and the Sacramento History Museum. Sol Collective hosts art workshops Saturday evenings in October, while the museum hosts the “Honoring Our Past” presentation Thursday, Oct. 19, and the Souls of the City Festival in Old Sacramento Saturday, Nov. 4. Since 2011, Sol Collective has worked to bring the ancient tradition of Dia de los Muertos (Day of the Dead) to the Sacramento community. Shrouded in mysticism for many Americans, Day of the Dead is a Mexican tradition celebrating and honoring the lives of relatives and ancestors past. Sol Collective’s annual Souls of the City festival and cultural arts programming offer hands-on education about the deep-rooted history and traditions of Dia de los Muertos. This workshop will teach the traditions of creating Dia De Los Muertos masks using plaster. These masks are traditionally used to hide one’s identity during Dia De Los Muertos ceremony. Participants will learn the techniques behind plaster mask making and decoration. This workshop is hands-on and communal. All participants will leave with a custom created plaster mask they have created. Sugar skulls are a traditional offering used to celebrate the Mexican holiday Dia de Los Muertos. Usually placed as decorations to recognize those who have passed away, the sugar skull represents a departed soul and can have the name written on the forehead to be placed at a home altar or gravestone to honor the loved ones no longer with us. In this workshop Sugar Skulls will be colorfully decorated with icing, tin foil, glitter and colorful sugars. Fun for the whole family! And If cared for and kept dry, they can last for years. There are many other Fall Festivals, Pumpkin Patches, Haunted Houses throughout the area check your local parks and recreation web pages, city web pages for events throughout your region.